The anarchist group Rouvikonas struck again early on Tuesday when some of its members scaled the gates of the Foreign Ministry in central Athens and left a bag containing a Palestinian flag and photographs of people killed in recent clashes with the Israeli army. There were no arrests but, according to police, two suspects – Greek men, aged 24 and 39 – who are believed to have participated in a paint attack on the same building by the group last month, have been identified. A video of on Tuesday’s incident, posted on anti-authoritarian websites, shows a number of individuals climbing over a gate and leaving a bag on a path between two buildings. 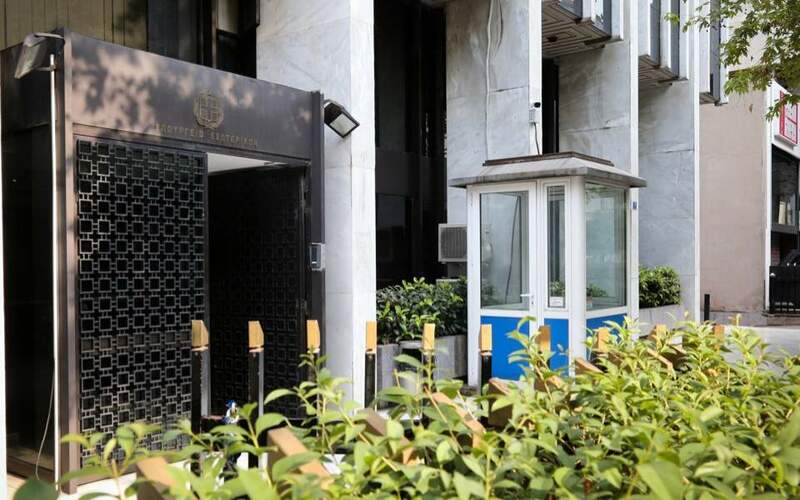 The main conservative opposition New Democracy commented that the “invasion” of the building showed that nothing was safe in SYRIZA-ruled Greece. “After the Defense Ministry and the embassies, now an invasion of the Foreign Ministry in the heart of Athens! Nothing works in the SYRIZA era. Nothing can be considered safe,” the party’s shadow foreign minister, Giorgos Koumoutsakos, wrote on his Twitter account. Rouvikonas (Rubicon in Greek) has conducted dozens of attacks on politicians’ offices, foreign embassies, state agencies and other perceived targets, usually involving throwing paint or leaflets, sometimes smashing windows and vandalizing furniture.